The Puli has become a national symbol in its native country, Hungary. Since the 10th Century, these dogs were bred to be the companion and working partner of shepherds who lived out on the great plains with their flocks. As such, the Puli is both hard-working and a loyal companion. These little dogs were great fighters too – often taking on wolves that preyed on their flocks. Those masses of hair protected its skin from being bitten. They almost became extinct after World War II and have been revived through a committed breeding programme. Even today, the Puli is a rarity outside of Hungary, but they make great pets who are devoted, affectionate and eager to please. Pulik is the plural of Puli. Lovable, long-corded locks are the main feature of this good-looking and clever dog. Pulik are intelligent and fun-loving and because of both of these characteristics, they are very easy to train. They enjoy the stimulation of learning and are focused and determined when set a task. They have been known to be used as Police dogs. Their cute, cuddly non-threatening appearance is misleading, though, because they are actually great guard dogs – described as ‘sensibly suspicious’ and extremely courageous. Pulik are energetic dogs and require daily exercise, but they are also happy just to snuggle up in front of the TV and this versatility makes them a wonderful pet. They can be wary of other animals, but are generally affectionate towards humans and good with children because they like to play. The Pulik unique corded coat looks much like human dreadlocks. These occur naturally but keeping up that perfected ‘shagginess’ or ‘mop’ requires some time and effort! The coat takes about five years to reach full length and the most critical time of this growth is when the dog is aged between nine and 18 months – the cords need lots of attention so they separate, mat and form properly. They must not be brushed – mats that have formed should be separated by hand on a regular basis. Because it is so thick – the coarse outer-coat covers a woolly undercoat – the Puli coat takes a long time to wash and dry. The coat also needs regular checking because leaves, twigs and other debris can get tangled in the cords. In the summer months the Puli requires ample shade and cool area to lie in. The coat acts as an insulator against heat, but the black color of the coat makes them hot in direct sunlight. 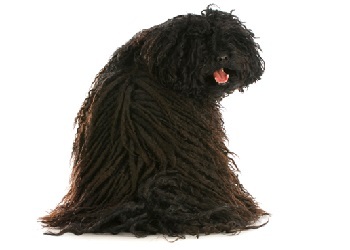 The Puli’s coat does not shed like typical dog hair, and as such they are considered hypo-allergenic. Pulik are great with active families with school-age children. For families with children it is best they are introduced as puppies, as some Pulik not exposed to children at an early age can be wary of them. As long as they get daily exercise, Pulik are well suited to apartment life. The Puli is an interesting-looking dog with an amazing history – a real conversation starter – and makes a wonderful pet, but it really needs a devoted owner who can spend time looking after its coat. Common hereditary problems Hip dysplasia, Progressive Retinal Atrophy (PRA) and cataract.